Video clip synopsis – Misadventure turned to good fortune when young English artist Augustus Earle was rescued after being marooned on a remote island and accidentally became the colony’s first trained artist. Broadband MP4 augearle_bb.mp4 (19.1MB), suitable for iPods and computer downloads. Students have the opportunity through accessing this Hidden Treasure online video clip to develop the ICT skill of comprehending and using historical sources. In respect to what students learn about: viewing this clip and completing the associated classroom activities, gives students the opportunity to learn about how people lived in Australia in the early part of the nineteenth century. In respect to what students learn to: viewing this video clip and completing the associated classroom activities allows students to use primary sources to describe features of lifestyle of a variety of social groups. Misadventure turned to good fortune when young English artist Augustus Earle was rescued after being marooned on a remote island and accidentally became the colony’s first trained artist. Earle was stranded for nine months with his dog, Jemmy, on an island in the South Atlantic Ocean when his ship sailed without him in March 1824. He filled his time recording life on the island until his art supplies ran out. The artist and his dog appear in many of his island paintings. Earle was eventually picked up by a ship bound for Sydney and during the few years he lived in the colony he became its foremost painter. Included in the National Library’s collection is an 1826 oil portrait of Bungaree, the first Aborigine to circumnavigate Australia. The key images in this episode are the portrait and lithograph of the Aboriginal man, Bungaree. 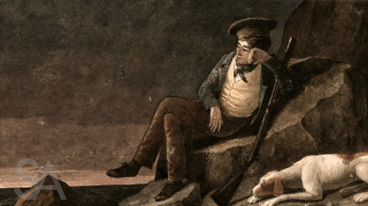 Describe the way Bungaree is portrayed in the portrait, including his clothing, ornamentation or decorations, pose or stance, and the background. What do you think is the main message that the painter, Augustus Earle, is trying to convey in this portrait? How is this image or impression of Bungaree changed in the lithographs that were created from the portrait? What would you say were Bungaree’s achievements? Why would these be considered achievements? For example, you might discuss the difficulty that a person might have in trying to live in two different worlds, the Indigenous world and the new one brought in by the settlement of Sydney Cove. Analyse the significance of the journey Bungaree took with Matthew Flinders in 1803. Research. The portrait is of a significant figure in Australian colonial history. Research another significant Indigenous figure (such as Jandamara, Yagan, Bennelong) and tell their story. Include in your presentation the nature of their achievements, their role in the period and place where they existed, and the way they have been represented in images. What do you think this portrait of Bungaree tells us about the relationship between the white settlers and the indigenous people of Australia. Summarise in just one or two sentences why this portrait is a ‘treasure’ in our knowledge and understanding of aspects of Australian history.